Gladiator Games is a five reel, thirty-pay line online slot machine that is powered by WinADay casinos proprietary software. Your gladiator will need to defend himself with the latest gear like body Armor, a helmet, a sword, and a shield. You are going to be setting up your gladiator to fight in the area against tough opponents. Naturally, you will need to keep him well equip. 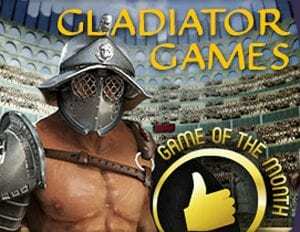 Once your begin to play Gladiator Games you will need to choose how much cash you are going to play with. After you select how much money you want to bet, choose how many payline you want to wager with. Gladiator Games has symbols that have eye-popping graphics that can only be found at WinADay Casino. The symbols you will see on the reel are a Roman Man, Coins, Lions, Warriors, a Fruit, and a Gate. The Gate Symbol is the wild symbols when you are playing Gladiator Games USA online slots. When you obtain the Wild Symbol, you will change all of the Lion symbols into Wild Symbols, which will enable you to substitute them for any other symbol. The goal when playing Gladiator Games for real money is to have a real Gladiator fight and beat your opponent. The scatter symbol in Gladiator Games is The Trophy Chest. Once you get a trophy check at the bottom of the reels any of the scatter symbols that come up will put more money in your Trophy Chest. The only way to win the Trophy Chest is to beat your opponent in a duel at the Gladiator Arena. Keep in mind, if you lose the amount of money in your Trophy Chest will reset to zero. Once you collect all of the symbols you will be able to begin your battle in the arena; the scatter symbol will appear on the fifth reel. When you play slots for real money you will be able to fight in three different arenas, The Fortuna, The Apollo, and The Neptune. The conditions for each of the arenas are the same. However, you will not find the same audience. When you are fighting in The Neptune Arena, you can select the Charisma Reward, which is the highest award in this field and The Fortuna Area as well. The folks at the Apollo Arena are a tough crowd and will not be so friendly. Once you begin your Gladiator duel, you will choose your real money tactics for your Gladiator. One great tactic that PlaySlots4RealMoney.com likes is the Combat Precision. The Combat Precision will enable your Gladiator to fight better and improve his skills. The Charisma Award will entertain the audience with his tricks, speed, and fitness. You will also be able to use the Increased Shield Strength; this will improve your ability to defend yourself. One thing to keep in mind when you are playing slots online for real money is that there are many different types of attacks and defenses that you can use. Some of the tactics are stronger than others and will enable you to defeat your opponent quicker and easier. Sign up for WinADay Casino now and claim your twenty-six dollar no deposit bonus.